So last post I was saying how I was going to probably not finish my Luscious sweater in time… but I will have you know that dedication and several seasons of TV episodes will certainly take you pretty far. 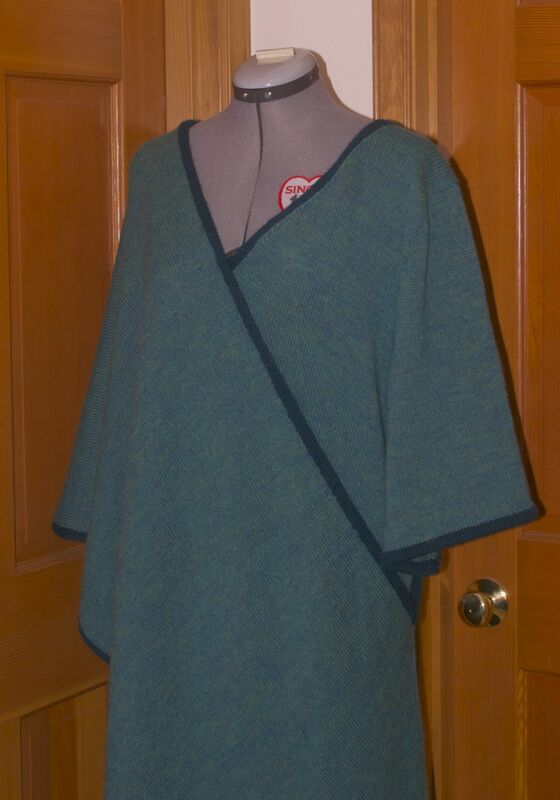 I actually finished all the pieces to my sweater, and was starting to assemble on the 13th. woohoo! Look at how cool it is looking! I am not a tall person. I come in at just under 5ft 5in. And after assembling the main drape, I tested out the size and it seemed rather long. But ever the optimist… I hoped that it would just be a little long and some of that would be corrected in the rest of the assembly. So I added in the sleeve section and tried it on again. The tail on me would be dragging on the floor. Could it be that I was just too short? I pinned up the side drape…. and nope… it was just the right length. There is about a foot of difference between the two points. So needless to say… I didn’t take my sweater on vacation. So now I am working on garnering up the internal fortitude and creativity in an effort to try and fix it. As to what went wrong… well I can’t be certain, since I consider myself a more intermediate knitter. This is after all my second sweater. My theory, which is based solely on the errors I have found (first two were confirmed by the company that published the pattern – the remaining errors I have still to submit and figured I would collect them all in one email at the end) is that this sweater was not test knit in the larger sizes, and the issue lies someplace in that particular area. The details of my issues you can read about on this projects Ravelry page. And so… I did say I was setting it aside while I was traveling and going to work on a shawl, and learn the art of chart reading anyway… right? About that……. well starting a lace chart project at 3AM at the airport is probably not the wisest idea. I should have learned from the myriad of times I picked up and put down the Branching Out portions of the Family Tree Baby Blanket while on various flights. But no… I cast on and got to the second row of the chart and found I’d already made a mistake someplace. 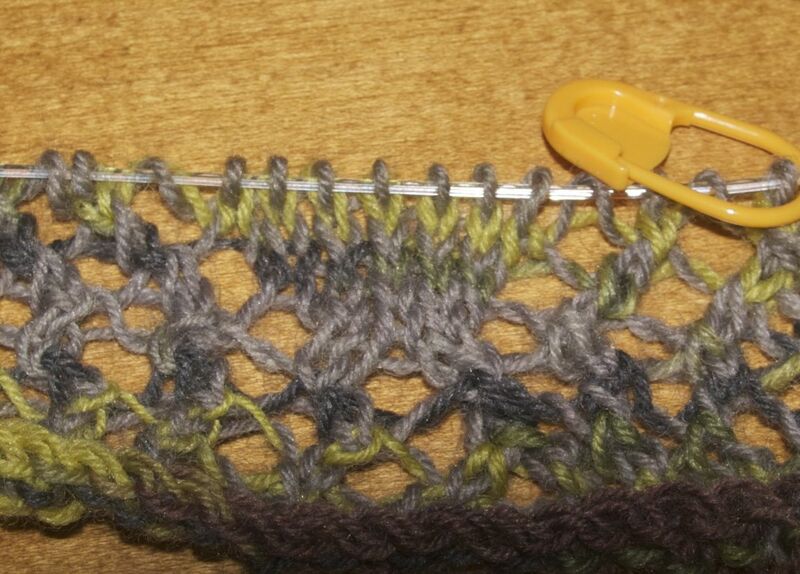 So in Amsterdam I frogged those few rows and cast on again. And I knit the first 14 rows between there and here right after we got back with our jet lag brain. Kind of a terrible picture… but you get the idea here. But when you get into the second section something has gone clearly awry… my feather points look like a pair of dutch-boy pantaloons. So its kinda looking like a second frogging. 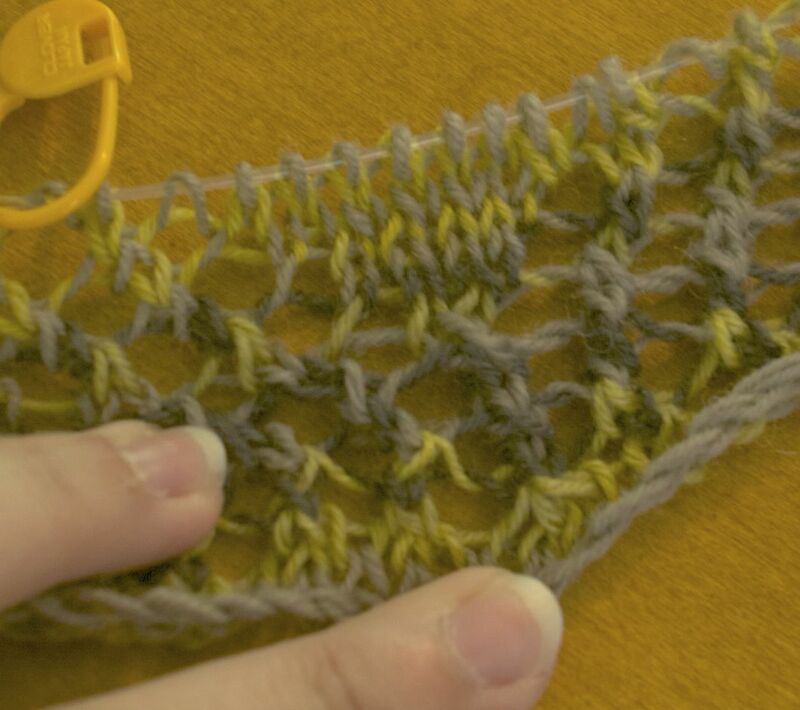 (For those not in the knitting know… its called frogging because you “Rip-it” out.) Which brings us to a new joke I heard while in Amsterdam…. You shouldn’t try to explain puns to kleptomaniacs. They take things literally. I will see myself out….